This article goes through a computer case and answers the question “what is a computer case”? The first process in the parts selection is choosing the right computer case for the desktop. There are various matters and things to take into consideration when choosing the right computer case. There are many functional areas and many other non-functioning areas that need to be examined before making a decision. In the functional means, the size and the shape of the case are considered while in the non-functional, the aesthetic and the colour selection are taken into account. Other names for the computer case are housing, cabinet box, tower, computer chassis, enclosure, system unit or a simple case. 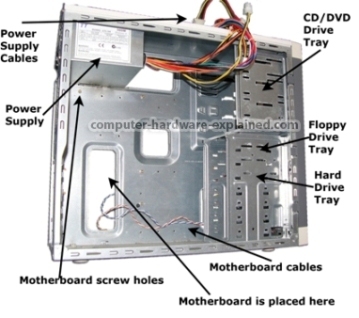 It is basically a closet that has all the components of the computer, but it doesn’t have main part of the computer like mouse, keyboard and display. Many people have this misconception that the CPU, and the hard drive are the main components to be added in the computer case, however this is not true. Mainly steel is used in the manufacturing process of the cases, while wood and some logs are also used in other types of cases. What Do Computer Cases Looks Like? Till the era of 90’s, beige was the colour of the case with rectangular shape. Even today beige paint coloured computer cases are found in many computer assembly. In order to draw the more advanced and unusual use of the case components – case molding is used. It is one of the artistic styling of the computer system. In the year 2000, many cases got hold of slide panels and clear side system too. It allows the user to look inside the case when operating functions. Inside the mould system, there are lights, liquid cooling system and even customized paint too. Many people out of their interests also make case from steel, wood or aluminum. The major determinant of the computer case size is the motherboard, which is the main largest part of the computer components. The various sizes of the computer are called “factors”. Many blade servers and rack mounted cases also includes some external dimensions to it. Because these cases have to get fixed with specific enclosures too. For example, in case of any power supply and the motherboard of ATX, many external forms can be chosen from. Like flat desktop with a height less than its width, then the vertical form whose height must be more than the width. There is yet another x-shape, whose height is said to be around and equivalent to 2 inches. Many full size towers look larger in their volumes when compared with the desktop computer. In the configuration department, there are two major styles, the tower and the desktop. Tower Computer Case – The Computer Case is the most common used case and is mainly found in the three main sizes. Full tower, mid tower or a mini tower. The larger or full tower has a greater capability to store more hard drives and components and also allows for more room for component maintenance. This also makes installations easier when compared with the other two towers. At the same time there are always some space constraints as they take more space either in the home or in office. However for average usage of a person, the mid tower is considered to be the best among all others. When using the mini tower, its compatibility with the motherboard must be checked. Apart from this the box has to be expandable in order to meet all the requirements. Desktop Computer Case – When selecting a desktop case for the business, or for home, or for the purpose of games it is important to select the right one. The best desktop can be found by searching online for all the available options. All the best manufacturers of computer cases can also be searched on the web. Many of them are Antec, Power Up and Thermaltake. In the component sections of the computer cases, PC lighting, benzels, fans and supplies are also included. One can even look for the lowest price availability on the web for these components. The location varies for each case. Some are located on the middle of the case while others are found on the bottom of the case. The location also depends upon the placement of the CPU storage. There are various LED light displays that come in many colour designs and options. Normally in red, blue, green and even purple colours are available (but they mere raise the budget bar). Thus one mostly chooses from the normal commonly found colours. Black is the most preferred or adopted colour by default. Many cases themselves come in the black colour. Secondly black colour goes well with all the colours and décor designs. Each one of them is important in its own way and they overall determine the making and maintenance of the computer casing. Space has to be designed accurate, then compatibility with the motherboard is essential. The power supply and the cooling system have to be well established and then finally the material used for the making of compute case must be full proof. I hope this article on “What is a Computer Case” has been helpful to your understanding of the computer case and will benefit you and your choices of computer cases in the future. Give us your opinion on the Computer Keyboard! What is the best keyboard type? What do you use? Let us know!